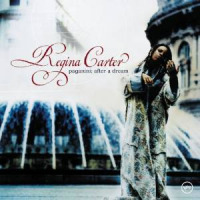 What does the award-winning, classically trained, jazz violinist Regina Carter do, after playing Niccolo Paganini's famous Guarneri "Cannon" violin in Paganini: After a Dream (Verve Music Group, 2003), or reinterpreting songs from the 1920s-1940s in I'll Be Seeing You ( Verve Music Group, 2006)? She directs her interests and passion towards African folk music in Reverse Thread, a significant work in her already diverse discography. A 2006 MacArthur Fellow, Carter took full advantage of the very generous funding to exhaustively research rich traditional music, that encompasses the reach of the African Diaspora. "Hiwumbe Awumba" is based on field recordings from Ugandan Jews, while "Un Aguinaldo Pa Regina" blends African music with harmonies originating in India and Puerto Rico, fresh interpretations of music from Mali or Madagascar, and the timeless sounds of ancestral instruments. From the hinterlands in Africa, Europe, and the Americas, this is modern folk music that is global, traditional, and full of soul. It's a communion of sounds, articulated by Carter's resonating violin, along with a fine ensemble of noted jazz artists and brilliant additions including the old-world timbre of accordionists Will Holshouser and Gary Versace, and Kora (21-string West African harp) master, Yacouba Sissoko. What might sound like a jig, a polka, or Cajun rug cutting music, might actually come from an African folktale through the infectious rhythm of "Kanou." The soothing hypnotism of "N'Teri" is uplifting, as the melody is layered by contrasting instrument textures. The variety is abundant. Whereas "the elongated melody of "Kothbiro" moves gently, "Full Time" is Afro-pop dance music, with Carter bowing effervescently, propelled by Mamadou Ba's funky bass and Alvester Garnett's (Carter's husband) tight drum work. The global demarcation lines are blurred throughout, whether in "Un Aguinaldo Pa Regina" or the festivities in "Zerapiki," originally an accordion-based song brought from Madagascar. A sense of spirituality is also present. The stirring rendition of the church hymn "Juru Nani / God Be With You" contains multiple styles and boundaries, exchanging ideas from Africa to America, while the haunting accordion/violin harmonies in "Mwana Talitambula" are based on a field recording of a woman singing in eastern Uganda. There's a trove of jewels waiting to be mined in Reverse Thread. 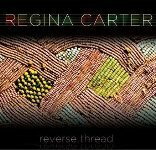 Thankfully, Carter's unquenchable thirst for new music has allowed her to produce this important recording. Track Listing: Hiwumbe Awumba; Full Time; N'Teri; Artistiya; Un Aguinaldo Pa Regina; Kothbiro (Intro); Kothbiro; Zerapiki; Day Dreamin on the Niger; Juru Nani / God Be With You; Kanou; Mwana Talitambula. 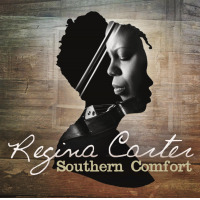 Personnel: Regina Carter: violin; Yacouba Sissoko: Kora (2, 3, 6, 7, 11); Adam Rogers: guitar (1, 5, 8); Will Holshouser: accordion (1, 7, 8, 10-12); Gary Versace: accordion; (2-5, 9); Chris Lightcap: bass;(1, 4, 5, 7, 8, 10-12); Mamadou Ba: bass (2, 3, 9); Alvester Garnett: drums, percussion; Joe Ferla: hand claps (8).